Flip open any fashion magazine & you will find an array of beaded Necklaces gracing the glossy pages. What you wont find anywhere else is the genuine quality & durability you will get from Fashion Jewelry 4 Everyone Pearls & Crystals. Our beaded Necklace features gorgeous with 100% Swarovski Crystals used. 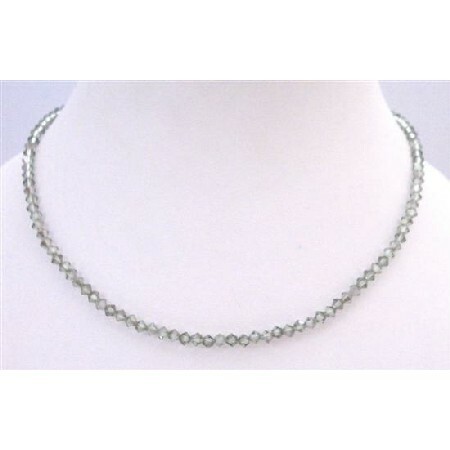 This is Round the neck Necklace with 4mm Bicone Chrysolite Satin this is beautiful & Crystals.All Swarovski & A Grade Crystals are used to make this beautiful String Necklace For Bridal or Bridesmaid or for any occasion. This is.a perfect sleek elegant & dainty The Necklace measures 16 inches & have lobster clasp for adjustment& extension upto 3 inches.Each has been hand-matched & hand strung; the Necklace.